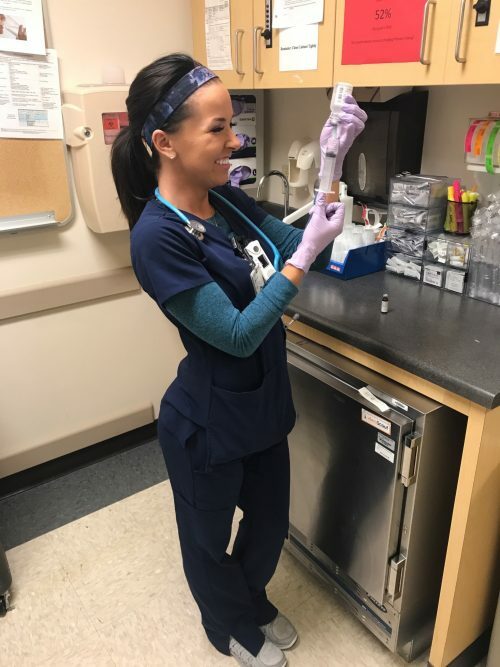 Veteran Vikings Cheerleader Jenn holds a Bachelor of Science in Nursing and uses the skills she has learned as a registered nurse and on the field every day! Read on below to learn all about Jenn. When did you decide to pursue a science career ? I realized I wanted to be a nurse when my grandma was sick in hospice care. I was fascinated and inspired by the work of the home-care nurse, and when she needed assistance with caring for my grandma, I was quick to volunteer. I fell in love with taking care of others, and made a career out of it as a Registered Nurse. Why did you try out to be a cheerleader? My sister was a former cheerleader for five seasons and inspired me to tryout. I saw being part of the Minnesota Vikings Cheerleaders as an opportunity to continue my passion for dance, to get involved in community service and outreach, and to be part of a team with 41 incredible women that inspire me every day. Please describe what you do as a registered nurse on a daily basis. I am a Registered Nurse on a cardiac unit at the hospital. I take care of patients suffering fromheart attacks, heart arrhythmias, and patients recovering from open-heart surgery. All of mypatients wear a heart monitor called telemetry. Through telemetry, I am able to measure thepatient’s vital signs, heart rates and heart rhythms to better determine proper treatment. What does it mean for you to be practicing medicine? One of the things that I love most about being a Registered Nurse is that I learn something new every single day. Medicine is constantly evolving. As a nurse I must stay up to date on current evidence-based practice, breakthrough treatments, as wells as new technology. Heart disease is the leading cause of death in the United States, and I love taking what I have learned and educating patients on proper diet, exercise, and giving them tools to reduce the risk of heart disease when they leave the hospital. How do the qualities that make you a great cheerleader benefit you in your health career? One of the most important qualities of being a great cheerleader is the willingness to adapt to new situations. Football games are anything but predictable, and sometimes as cheerleaders we rehearse for weeks to perfect our routines, and last minute need to make changes. Adaptability and willingness to make changes as a cheerleader has also benefited me as a nurse. Every one of my patients is unique, and sometimes standard treatments need to be modified to better fit that individual. Best cheerleading experience? Some of my best experiences as a Minnesota Vikings Cheerleader have happened beyond the football field. One event that will always stand out to me was the Minnesota Vikings Cheerleaders Special Stars Cheer Team clinic. At this event 29 young girls with cognitive or physical special needs were invited for an evening at The Vikings practice facility. Each young girl was assigned a Minnesota Vikings Cheerleader “cheer sister”. We spent the night learning cheers and dance routines, followed by a big performance for friends and family. I love to giveback to the community, and to be a role model for young women. Best science/health-related experience? The best part of being a nurse is the impact I make on my patient’s lives. There are few things as humbling and rewarding as saving someone’s life. I love that I get to leave work everyday knowing I made an impact on others. What advice would you give your 12-year-old self? Growing up I didn’t like going to my math and sciences classes, because I didn’t think I was any good at math or science. I didn’t consider a career in the medical field until college because I didn’t believe I was smart enough. If I could go back and offer my 12-year-old self advice, I would tell myself to be confident and to stop minimizing my intelligence. What’s one thing people might find especially surprising about you? Something that might surprise people about me is that in addition to being a nurse and a cheerleader, I played hockey in college!